We are writing to you again with serious concerns about the situation of Mohammad Ghamari Tabasi. 1) In our previous letter to you, dated February 10, 2011, we requested housing assistance on behalf of Mohammad Ghamari Tabasi. Although you have promised to uphold your mandate and provide housing assistance to Mr. Tabasi in your letter of February 11, 2011, in which you state that UNHCR in Iraq is “ready to provide assistance and advice to anyone who is in need of it,” Mr. Tabasi reports that UNHCR has refused to provide him assistance with housing. 2) Mr. Tabasi has also requested assistance from the Erbil office with registering his teen-aged son for school. As a refugee, his son has the right to access public education. And although UNHCR is obligated to work to uphold the rights of refugees, Mr. Tabasi reports that your offices in Erbil have refused to assist with registering his son for school. Mr. Tabasi also reports that UNHCR staffperson Hawreh Abdullah told him to contact the Embassy of the Islamic Republic to obtain assistance in registering his son for school in Iraq. Further, he was told that if he was not able to contact the Embassy of the Islamic Republic, that UNHCR staff would contact the Embassy about his son for him. Referring a political refugee to the authority representing the suppressive regime for basic services like schooling constitutes an implicit threat against Mr. Tabasi and his family and is not acceptable from UNHCR. 3) Tabasi’s residence permission has not been renewed. He was promised by the Erbil office on December 22, 2010, to be assisted in this respect by transferring his files from Suleimaniya to Erbil. UNHCR has not fulfilled their obligation, and as result, Mr. Tabasi now lacks right of residence. Asayesh (security) has asked him to go to Suleimaniya to renew his residential permit, but given the extremely insecure and unstable situation, it is impossible for Mr. Tabasi, who is now lacking updated permissions, to obtain his residence status from Suleimaniya. It is clear that the most basic human rights of Tabasi and his family are not being upheld in Iraq. 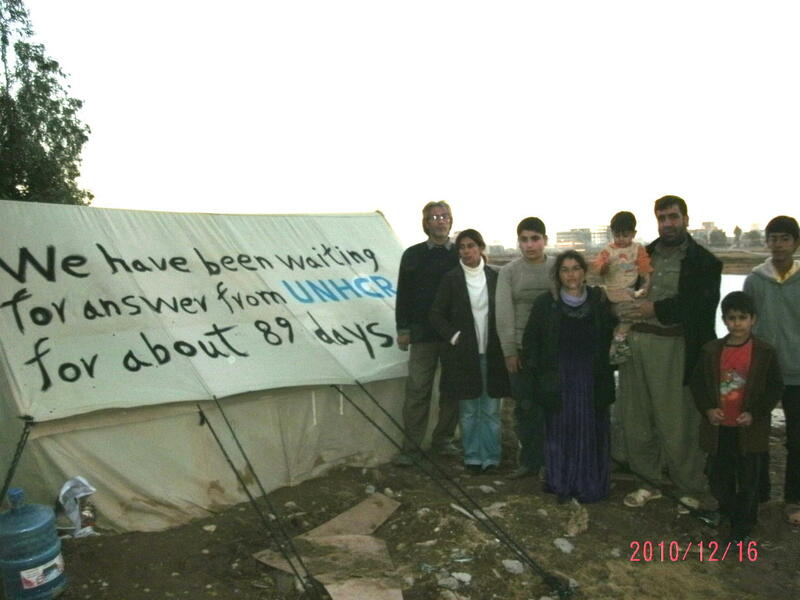 Due to obvious lack of respect for human rights in Iraq, the inability to obtain shelter, the inability to register a child for school, due to the illegal deportations of Iranian refugees from Iraq, and due to UNHCR’s obvious incapability to provide any assistance whatsoever for Iranian asylum seekers regarding any of the above issues, we demand that Tabasi and his family be immediately resettled to a safe third country, as is their right. We demand that UNHCR immediately begins to operate according to its mandate and duties regarding the case of Tabasi, as well as for all refugees in Iraq.